This cute girl right here is Imoen of Candlekeep. I guess that would be the most fitting last name, although it is never used in any text that I've come across. If you are reading this, probably you already know everything I could ever tell you about her, but maybe you just stumbled upon this website and are curiously poking for information. Ignoring the fact that this speech is terribly nerdy of me, let me introduce you to this cheery, happy-go-lucky girl. Age: Early twenties. Presumed to be 21. Trade: Thief in her early adventuring days; switched to magic-user later on. Weight: Guessing the weight of a lady, especially one that can fry your eyebrows by snapping her fingers, might be the last mistake you make in your life. She's a small framed girl. "When asked about her past, Imoen slaps your shoulder playfully. She says that you of all people should know, seeing as how you grew up together. Indeed, some of your fondest memories are of meeting this sprightly young lass. She apparently came to Candlekeep much as you did, though 10 years later in life, and she spent much more time with the guff Winthrop than Gorion. "Puffguts" she would call him, much to the old innkeep's dismay. She seems the eternal child, and is quite content to play the part of little sister, though you are both of comparative ages. You can tell by her hearty smile that she will always be willing to travel with you, no matter what path you take." Hmm. Not even looking at the appearance changes, I'm pretty sure I'm not the only one that sees contradictions, or at least plot holes, between those two biographies. 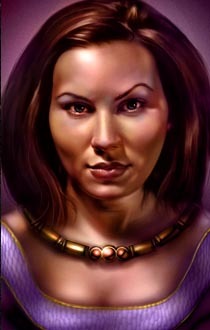 The (presumed) reason for this, and the tremendous lack of content concerning her throughout the whole game, is that Imoen as a playable permanent NPC in Baldur's Gate II is pretty much an afterthought. Originally, she was planned to be kidnapped by the villian of the game, Irenicus, and later on be found completely insane. Rumor has it that she would appear in the Throne of Bhaal (ToB) expansion as an enemy to defeat (she would turn into the Ravager, one of Bhaal's avatars, and attack you). However, user feedback prior to the release of the game led the developers to change their minds about this. Apparently, Imoen was a very cherished character by many a Baldur's Gate I adventurer. It only made sense, since she appeared to be this sweet, funny girl that the protagonist has grown up with. She even conforts you right after your foster father dies in front of your eyes. So instead of remaining a hopeless loonie, they let her recover her sanity after you find her in the Asylum she was taken to when kidnapped. This being in the late stages of development, there was no time to give her the level of party interaction that every other NPC in the game has. Woe is us: one of the favorite characters in the game for many players (although hated by others), and she was almost mute through the whole adventure! We weep. Imoen starts out in Candlekeep as a mischievous youngster. She is portrayed as a carefree, cheery girl that enjoys playing silly or practical jokes and sneaking away from her chores. She has "long fingers" and an eye for difficult locks. She actually joins your party with a magic wand that presumably she "borrowed" before getting out of Candlekeep to follow you... you can choose to complete the entire game with her as a companion, from searching your foster father's body to finding out you are a Bhaalspawn: a child of Bhaal, a god that foresaw his own death and sought to spread his seed all over the world before he died. Although you can only imagine her reaction to all these things, as Baldur's Gate I didn't have all that much depth concerning party interaction. It can be assumed however that she remains the same all through the first game's story. 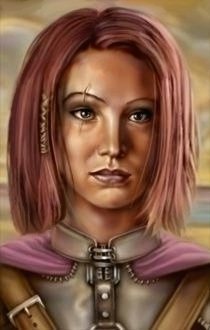 However, she undergoes a series of traumatic experiences after you are taken into the custody of Jon Irenicus (the beginning of Baldur's Gate II). Irenicus' several physical and psychological tortures carve a deep wound in Imoen that dramatically alter her way of thinking and seeing life. Her expression change in the different portraits shows this quite well (without looking at the obvious change of face - not even puberty does that!). Although her external personality is still quite the same - save some bleak interludes - and she keeps an optimistic, "let's make light of things" spirit, Imoen is scarred to a terrible extent in the inside. It doesn't help her either that, apparently, she is a Bhaalspawn too (a notion that presents itself in the game as an afterthought, but hey, you gotta deal with it). She starts developing powers in ToB, like you did earlier, which makes her panic about eventually turning into the Slayer just like you did. Not an easy life for Imoen, no. Imoen is a rogue that became interested in magic as she saw more of the world. At least, this is what we can make out of Imoen's sudden class change at the beginning of Baldur's Gate II, which probably is nothing but another plot element without any actual characterization behind it. However, by taking a look at her stats up there, it feels like a natural choice. 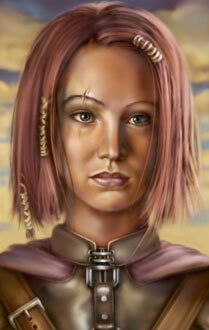 Imoen is very intelligent, clever and witty, although her somewhat impulsive choices aren't always the best. She has excellent coordination, good reflexes and is skilled with her hands. It is logical that she became bored or unchallenged with only stealing things and sneaking behind people, and turned her eyes to the wonders of magic; especially given her insatiable curiosity and love for new and exciting things, coupled with her love of books - you really need to like reading to study those esoteric volumes. Hindered only by her tendency to switch focus and randomly jump from topic to topic, making concentrating on only one task more difficult, Imoen has the potential to become an impressive arch-sorceress. Which she actually does if you have her with you until the end. Seeing what is written above, it's not a mystery why I chose to make a modification for the game (a Mod) and try to improve the "Imoen experience". Dealing with all these things is what this modification is about, especially the ToB part that is currently under development. Filling plot holes and giving Imoen the depth she could have had if more time had been available, on top of providing a chance to fall in love with this lovely gal. After three years of writing it, I'm not especially proud of the way it all is done in the Shadows of Amn part, though. I wish I had the time to rewrite and rethink many of the things that are there. Still, many players liked it very much, some even loved it (oh my)... so go ahead and give it a shot! And may her Sugarness smile upon you.